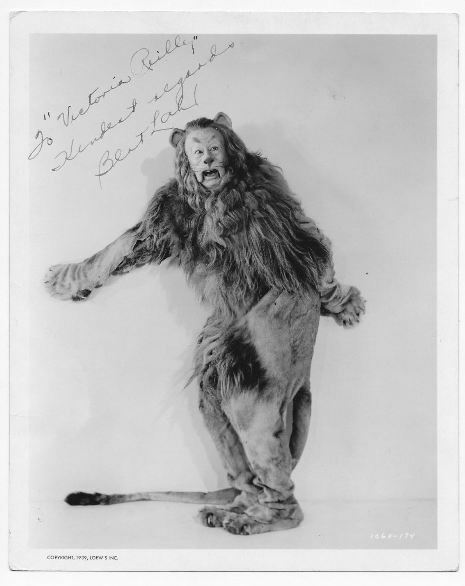 Spectacular and extremely rare and desirable vintage glossy 8 x 10 MGM Wizard of Oz promotional photo of Lahr as the Cowardly Lion, signed and inscribed vertically in fountain pen “To “Victoria Reilly” Kindest Regards Bert Lahr.” Victoria Reilly was a dancer and wardrobe mistress! She obtained many signed photos, inscribed from stage & film artists from 1900 -1940’s. Normal border wear otherwise in very good condition. BID OR MAKE AN OFFER ON MEMORABILIA UPDATED EVERYDAY ON EBAY.....CHECK OUT TRISH HESSEY AUTOGRAPHS ON EBAY! How to avoid buying fake autographed sports memorabilia. A Name you've come to trust! From 1996 thru 2004 Trish served as Director of Corporate Sales and Acquisitions for Odyssey Group, Inc./Collector's Universe, a leading dealer of autographs and historical documents. During her tenure, Trish bought and sold many millions of dollars of authentic autographs and developed a knowledge and reputation for expertise and customer service virtually unparalleled in the industry. CLICK HERE TO RECEIVE OUR NEWSLETTER, RECEIVE UPDATES ON NEW ITEMS, AND RECEIVE PREFERRED PRICING.